Thousands of hareidim take to the streets in Jerusalem and Bnei Brak over freezing yeshiva funding, decry 'spiritual holocaust'. 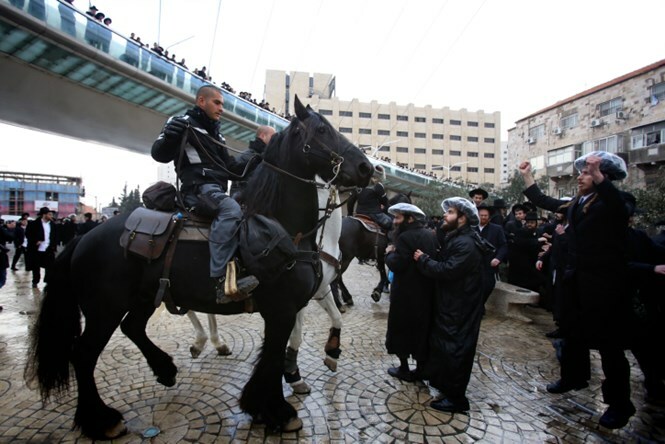 Thousands of hareidim protested Thursday at the entrance to Jerusalem and in Bnei Brak over the sudden freezing of funding for all yeshivas, which was ordered retroactively by Finance Minister Yair Lapid on Wednesday. Lapid's decision to cut funding came following a Supreme Court ruling Tuesday, stating that the government should stop funding yeshivas with 18-20 year-old students who received draft calls and did not enlist. The ruling came despite Defense Minister Moshe Ya'alon's orders to defer such steps until new laws on the issue are passed in the coming weeks. The protests Thursday turned violent in the clashes between hareidim and police, as one officer's weapon was stolen, and mounted police were called in to break up demonstrators. Four protesters were arrested in the course of events. Rabbi David Zicherman, a source close to Lithuanian-hareidi leader Rabbi Shmuel Auerbach, was among the organizers of the protest. During the confrontations he said "we are ready for gifts, for prayer, and for war," referencing the great sage Rashi's commentary on Genesis 32:9, in which Jacob, after leaving Laban, who had cheated him, prepares to meet Esau, fearing a confrontation and preferring peace. The rabbi added: "those sitting up there are 'Laban,'" making an acronym out of the last names of Lapid, Economy Minister Naftali Bennett, and Prime Minister Binyamin Netanyahu. "We survived Stalin in Russia, we survived Antiochus, and we will also survive Lapidus," he added. "We had a physical Holocaust in Europe, and here they want to carry out a spiritual Holocaust against us," charged Rabbi Zicherman. Senior sources in the hareidi world have warned that if the funding annulment is allowed to stand, "we'll go to civil disobedience." The Supreme Court ruling was predicted to be meaningless given that February budgets had already been ordered, but Lapid leaped on a loophole to retroactively block funding for all yeshivas, until those with students who did not enlist were weeded out. 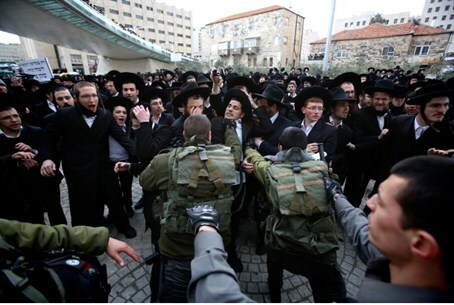 Hareidi MKs have responded with fury to the ruling and freeze; MK Moshe Gafni (United Torah Judaism) accused the High Court Wednesday of "declaring war" on the hareidim, while MK Nissim Ze'ev (Shas) decried the "ongoing campaign of persecution. 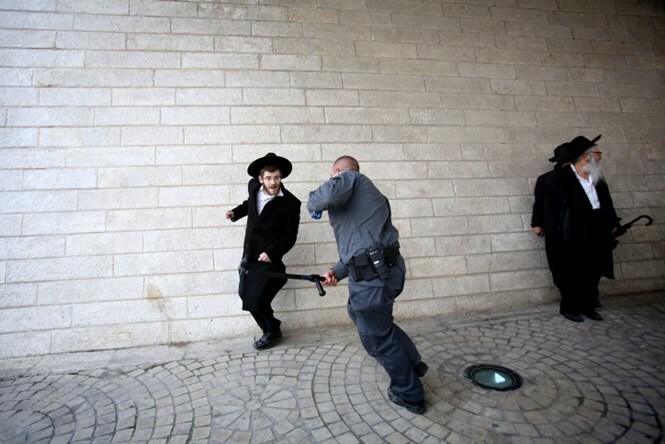 The government is attacking everything connected to religion or to the Torah world." Rabbis have been outspoken in criticism of Lapid's move. Rabbi Avichai Ronsky, head of the yeshiva in Itamar and former Chief Rabbi of the IDF, remarked that Lapid's "underhanded move in stopping to budgets to yeshivas, even those whose students have enlisted, casts heavy doubt on the honesty of his intentions."